So, you’ve created your compelling offer and you’ve drafted a few clear, concise headlines. You’ve honed your content into punchy bullet points and you’ve gathered your best customer testimonials. 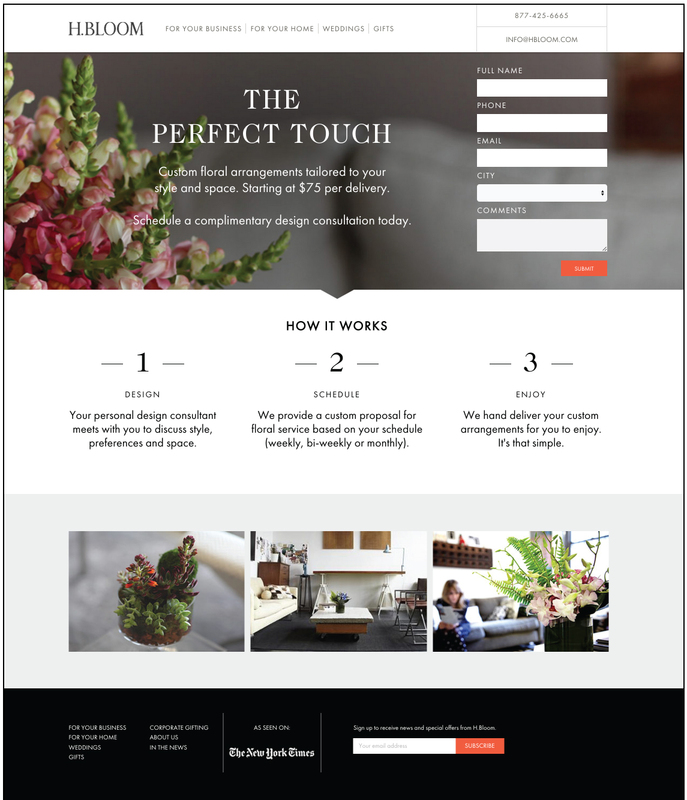 Now you just need to throw it together and you’ve got a great landing page, right? Not quite... While content is key for an effective landing page, great design will take it to the next level. Users make a quick, and I mean quick, decision when they view your landing page. Most users take just few seconds to scan your page before deciding to leave or read on. Great design can help make the most of those first few seconds, providing visual cues for where readers should focus and where to take action. Additionally, after your page has passed the first glance test, a well-desinged page will guide your reader though your content to conversion, whether that’s signing up for a free trial or downloading a ebook. Here are a few design tips that will help highlight your content and improve your landing pages. Adhere to your company’s brand colors, fonts and overall look when designing the page. Users can reach landing pages from many different sources, and you want them to be able to identify your company right away. 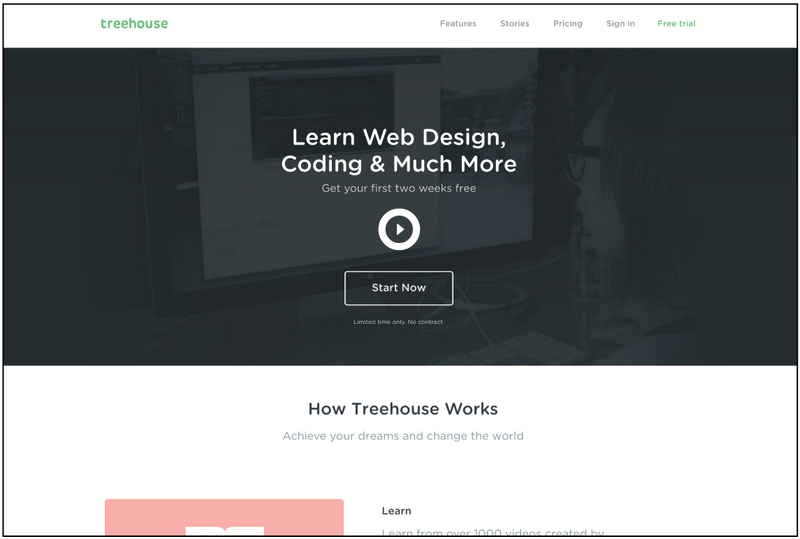 This simple Treehouse landing page uses the familiar rounded font and navy/green color scheme from their website to provide a consistent look. The purpose of a landing page is to get users to complete a task. Using a contrasting color to call out the form or submit button makes it easy for users to scan the page and find where they should take action. 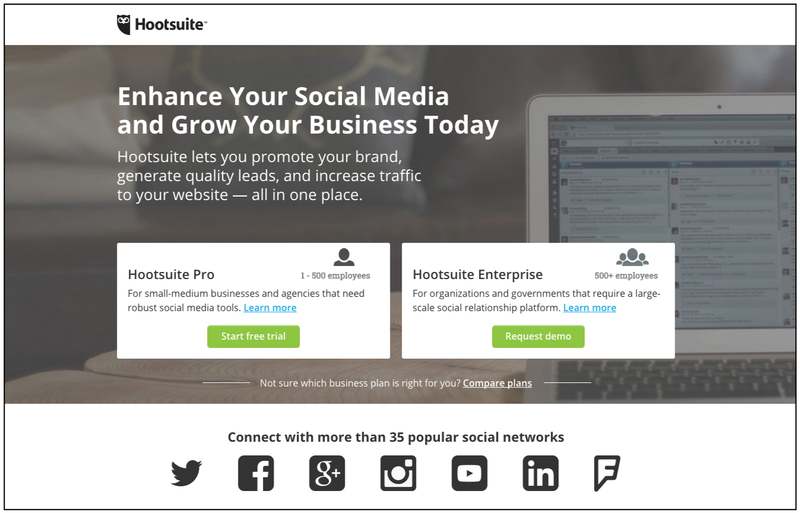 In this Hootsuite landing page, bright green makes the two buttons pop. Your landing page should provide just the necessary information, nothing more. Excess information or images creates a cluttered page and can distract from your message, which is the last thing you want! Hone your content, and then place the elements of your page in a logical order, so users can easily navigate. Headlines should stand out at the top of the page and place calls-to-action above the fold. In the example below, the the headline, offer and form are all placed ablove the fold. A subtle arrow shape in the banner image points users towards more content and images. Ample white space helps define the hiararchy of the page, creating a beautiful, easy to follow page.